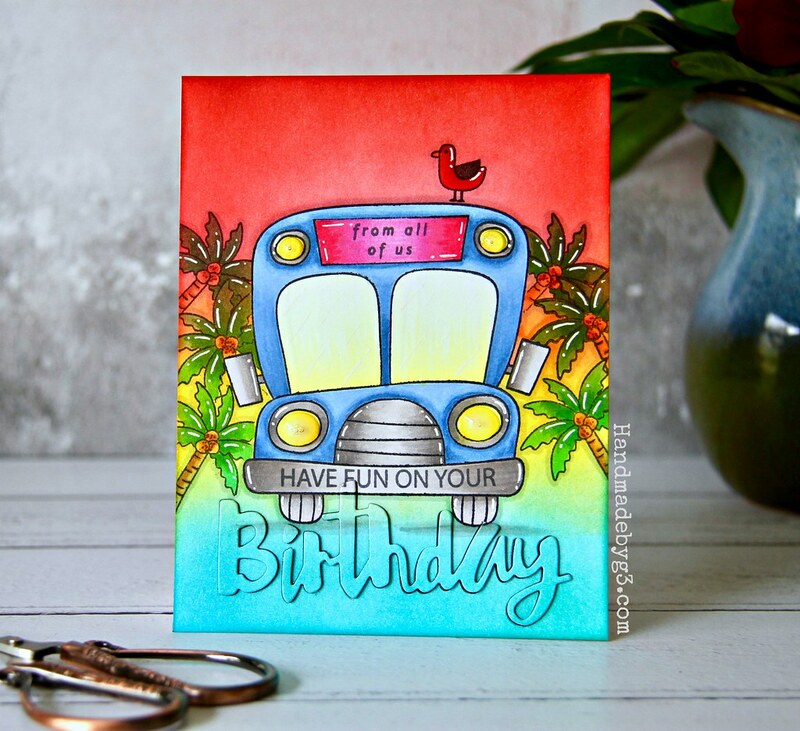 I have a very summery nearly one layer birthday card to share with you today. 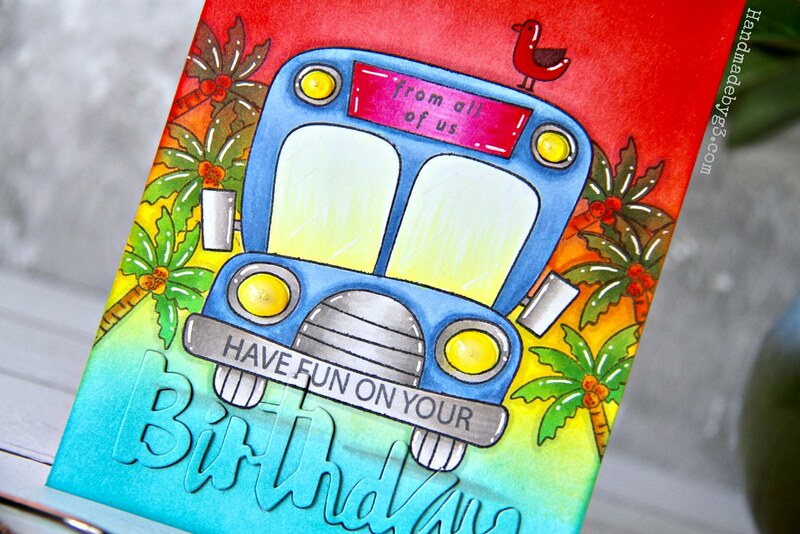 All the stamp sets and dies used on this card are from Simon Says Stamp. The plan before I started to make this card was to use the Simon Says Stamp’s school bus image and Dude die to make an eclipse card. Well, it didn’t turn out that way, did it? After stamping the bus image, I decided to add some trees around the bus. 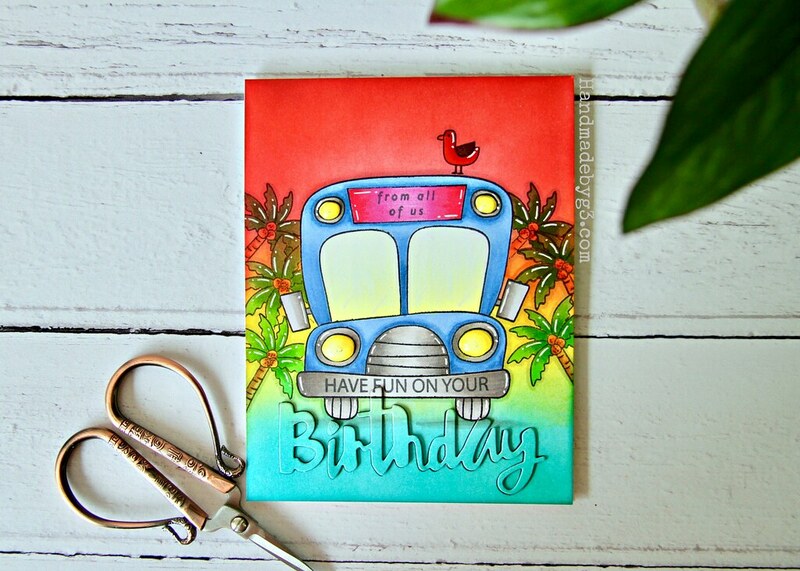 So I used the palm tree image from Surf’s Up stamp set to stamp, mask and stamp the trees around the bus image. I also stamped the bird image from Surf’s Up stamp set on top of the bus. When I stamped the bus image, I masked the “SCHOOL” sentiment on top of the bus because I want to stamp another sentiment in its place. I left the mask on the bus and sponged the entire panel with Fired Brick, Candied Apple, Mustard Seed and Peacock Feathers. Yes, I did sponge over the palm trees because I was not prepared to take the time to stamp and cut five more palm tree masks to cover them. I am lazy like that! Similarly the bird! 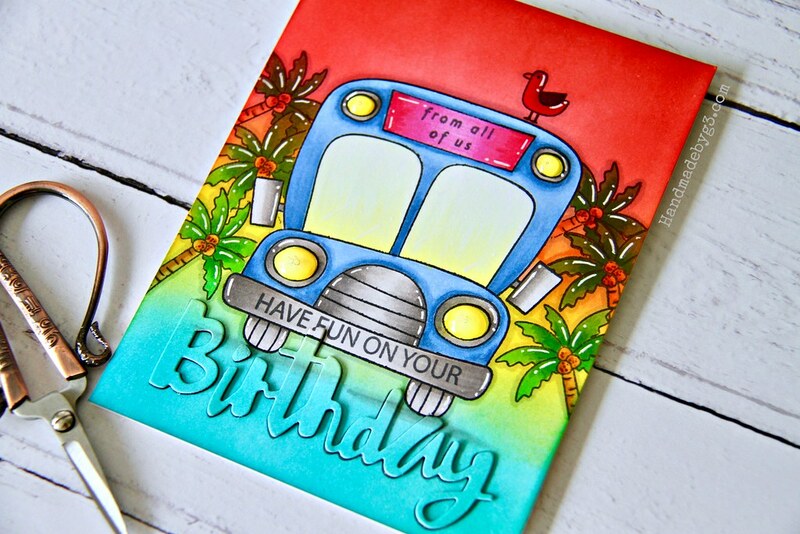 Then I removed the mask from the bus and using copic markers, I coloured the bus, the bird and the palm trees. I will list all the markers I used in the supplies list below. Using Sakura white gelly roll pen, I added highlight details. 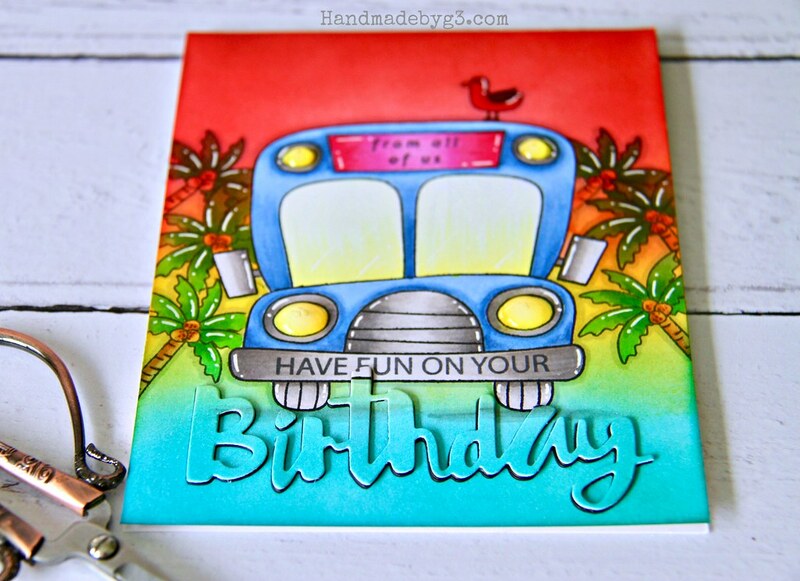 For the sentiment, I stamped the “Have Fun On Your” from School Bus Message stamp set on the bumper of the bus. Then on the top of the bus where the “school” sentiment used to be, I stamped “from all of us” sentiment from Beautiful Flowers stamp set. I used I still wanted to do a sort of an eclipse card. 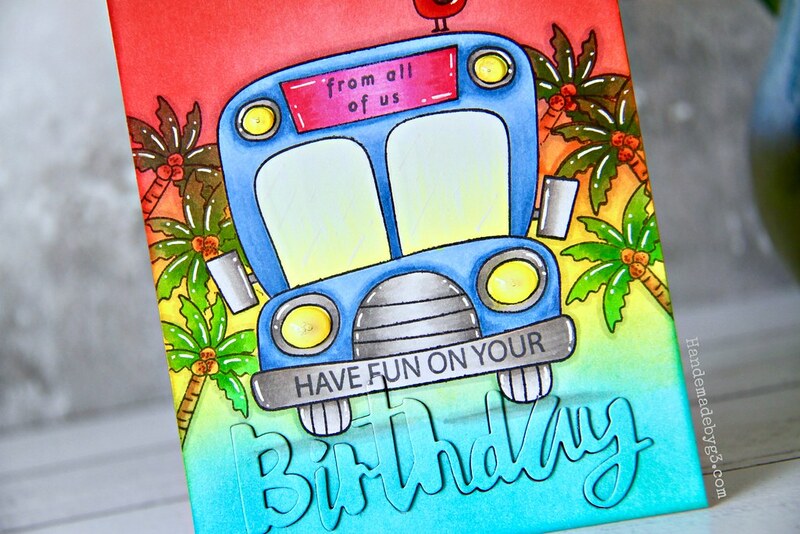 So I brought in Painted Happy Birthday die and used only the Birthday die to die cut below the bus and make an inlaid die cut with dimension. Not exactly an eclipse as there is no image on top the dimensional die cut. I just could not bring myself to die cut right through the middle of the stamped and coloured image. I really really love how this card turned out. I love the entire scene, the bright colours and the inlaid dimensional sentiment. One of my favourite card I have made. Hope you like this card as much as I do. Thanks for stopping by! Oh my, this is awesome! Love it!